Small Microheater. S12-200-1500 Temperature typical 1500C (2732F). Volts: 12 V each. if two in series 24 V.
Size of Microheater: Cylindrical Part ~ 2″ long**. Lug region is o.5″on each side. Attach wires with optional M6 bolts shown. Power: Up to 200W. Power Control: An optional DC Power Controller is Offered. 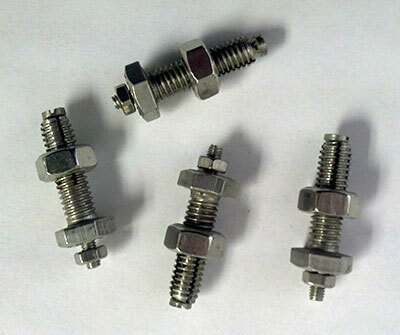 Accessory Pack M6 Bolts (picture shown) may be added from Available Options. Manufacturer: MHI Inc.USA. Patented Heater/Igniter/Glow Plug. If a DC supply is required one may order from MHI or elsewhere. DC power supplies unlike the AC supply panel will not offer a feedback control. Please note the following if a non-MHI supply is employed: Most DC power supplies max-out somewhere in their rated current or voltage (and power) but often allow independent control of each parameter – please check with supplier All these features will normally be called out be in the power-supply manual provided by the supply manufacturer. The current should not exceed 17-20 amps for a S12-200-1500. The S12-200-1500 heater will glow close to its highest temperature for 17-20A current with a corresponding potential drop of about (12-12.5V) in a free radiating mode. without insulation cover. USe for igniter or radiator. 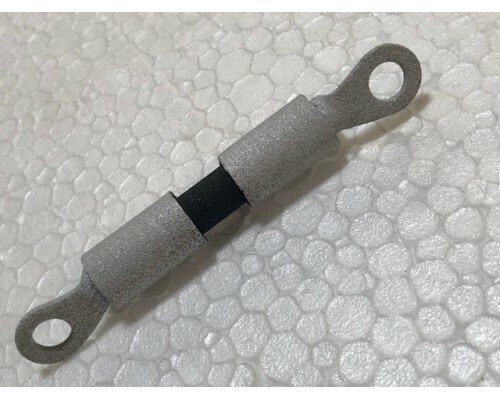 The voltage drop to be expected for two of such microheaters when connected in series for the S12-200 type is ~ 24-25V. Please note that some differences in cold start to glow start times (order of 1 minute for GAXP-IGMP) between units may be noted. An AC current controller enabled with a temperature feedback and power control mechanism may also be used instead of a DC power supply. The BPAN-O-PLUS is recommended as as a possible AC controller. The main features of this AC control panel are listed on http://mhi-inc.com/PG4/electronic-controllers-control-panels.html. Please contact MHI 513-772-0404 for more details. Element GAXP-IgMp. The more accurate measurement technique at these temperatures is a radiation pyrometer. Electricals: Maximum is 200 Watts. A 12V minimum supply rated for 17 Amps (variable) is the minimum required for heating to glowing conditions. Two power supplies are offered in the optional items category available for this microheater. These are the 12V and 24V DC (nominal) power generators/supplies. Please note that the 24V, 20A rated supply is for use with a set of two S12-200 heaters that are connected in series. The offered supplies will not produce more than 200W (12V) / 400W for two units (24V). When requiring to power more than two such microheaters simultaneously, a BPAN-O or BPAN-O-PLUS with feedback control is recommended. Please contact MHI for details (513-772-0404). Heating Rate: Instaneous. The heater will start getting hot as soon as power is introduced to it. Typically one will notice a glow (i.e when it is above ~800°C) in the order of less than a minute, when it is powered-up in a normal manner. The heater diameter is ~9 +-0.6 mm (nominal) (Not including the terminal forks/rings shown in the picture). The maximum heater amps (~17 Amps- 20Amps ) or temperature (which should be measured with a calibrated pyrometer) cannot be exceed. Please call MHI for emissivity settings. The rated amps and voltage are called out for use in a free radiating mode. If using in a confined mode instead (i.e. if free radiation is interrupted with insulation), please monitor the heater temperature so as not to exceed the maximum rated temperature of 1500C-1600C. 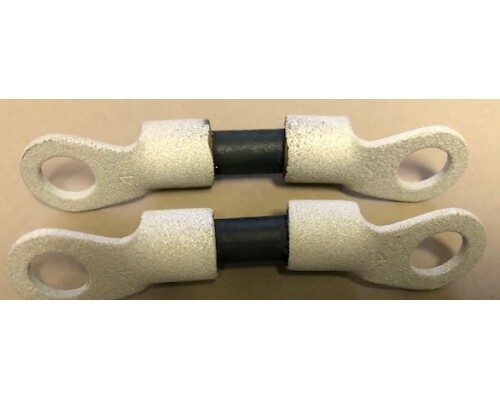 Please review the picture shown above or contact MHI for details if a different type of connector than shown is required. **Typical Supply Pictures Shown, Images are to be considered as approximate. Dimensions may not include ring or fork part of the lugs. Yes – the terminals will get hot but will take the heat. I have received the heater and control system, and it is all visually undamaged and exactly to my specifications. Thank you for your help! discovery with the Cascade e-Ion Plasma is indeed very exciting and the potential for all sorts of applications is enormous. MHI ……. the only heating elements that work well for us in these studies; when we publish our results — I will be sure to send you the reference, I see your on your website that you link to work utilizing MHI products. Product: THM and Robust Radiator..
Several years ago we have bought in your company the front loading M18-40 furnace and two robust radiators and got much satisfaction working with them. Now, we believe, it is a very time to substitute heating elements in the furnace and to buy new radiators. …..”This should get me right back on track with this project – which has gone very well thanks to your assistance”. “Everything is great! I’ve inspected the elements and roof refractory and everything is in great condition”. “We plan on continuing our relationship with MHI to further develop and sustain a robust localized heat treat capacity”.